If you see an amber light blinking on your Airport Extreme, it may be an indication that there is a firmware update required. These quick instructions show you how to find out if there is an update, and how to do the update. I suspect the process is essentially the same on an Apple Time Capsule router but I don’t have one with which to verify these instructions. The screens below show the upgrade from Firmware version 7.7.3 to 7.7.7 released in mid-2016. If you’re reading these instructions at a much later date (or are running a different version of the operating system) you may see different Firmware versions, but the instructions should be the same. Note the red "1" on the Airport Extreme (in my case called Tall Dart). This is an indication that an update is required. 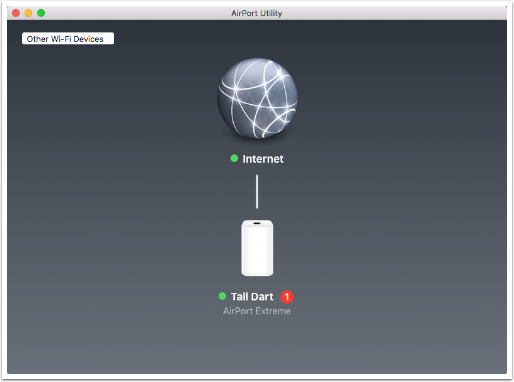 Click anywhere on the image of your Airport Extreme. This will cause a menu to pop up. 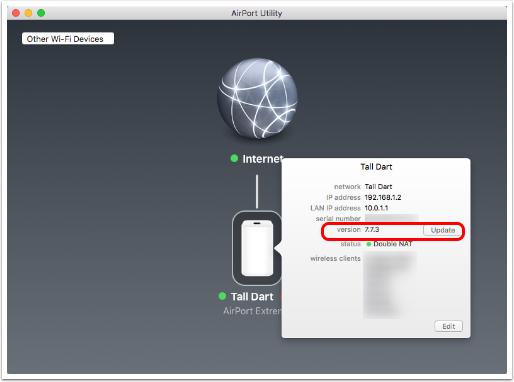 The version shown here is 7.7.3 but it says Update next to it. Simply push the Update button. 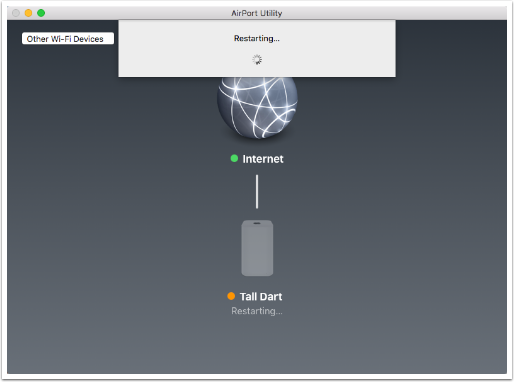 The green light on the Airport and on this screen both indicate that all is well but let’s click on the image of the Airport again and look to verify that the latest update has been applied. Our firmware has been updated successfully from 7.7.3 to 7.7.7 so we’re done.